JTCST (Journal of Tropical Crop Science and Technology), ISSN 2656-4742(online), is published by Department of Agrotechnology, Faculty of agriculture and animal science, University of Muhammadiyah Malang collaborates with Perhimpunan Agroteknologi Indonesia (PAGI)/Indonesian Association of Agrotechnology. 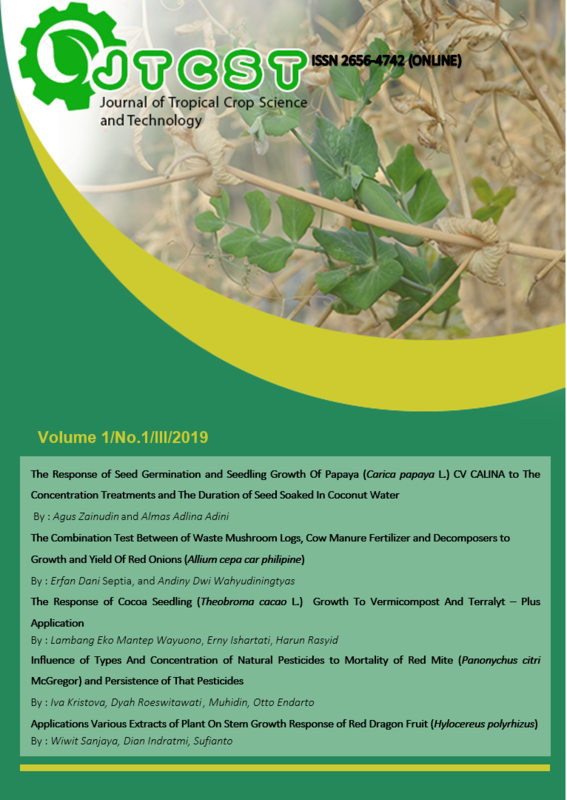 JTCST (Journal of Tropical Crop Science and Technology) publishes scientific papers on the results of the study/research and review of the literature in the sphere of tropical crop production and technology in agriculture. Additionally, this journal also covers the issues of plant biology, crop production and environmental science. Editors welcome scholars, researchers, and practitioners of education around the world to submit scholarly articles to be published through this journal. All articles will be reviewed by experts before accepted for publication. Each author is solely responsible for the content of published articles. Editors accept the article has not been published in other media with the writing format as listed on page manuscript writing guidelines.